We provide a number of helpful in-app notifications that will speed up your workflow by allowing you to accept invites to files, projects, and teams without needing to leave Figma. 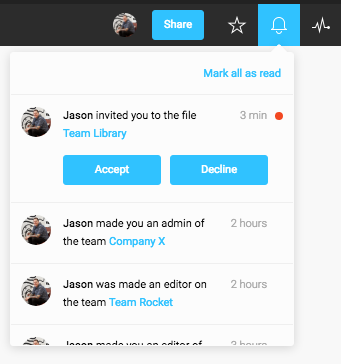 When you invite someone to a file, project, or a team, they will receive an in-app notification in the Figma File Browser. The red dot next to the bell icon lets you know there are notifications to view. Click the bell icon to view your notification history. You have the option to Accept or Decline the invitation. When you Accept, you are taken directly to the file or project. If you comment or edit a file you will start receiving notifications when others add comments to the file. It's not possible to unsubscribe from in-app comment notifications once you have engaged with the file by commenting. However, you can dismiss the red dot indicator on unviewed notifications, by clicking Mark all as read. The last 50 notifications received will be visible in the notification dropdown. You might also want to read over this article about Permissions and check out this video about Sharing Files in Figma.